Are you a wolf? Or are you a sheep? ARE YOU A WOLF OR ARE YOU A SHEEP? As he noted last March, Gregg Marshall is a goddamn wolf — and the day he rolls out of bed and considers himself a sheep will be the day the American economy wheezes its final hungry breath. One of the best things about college football is how wildly the philosophies vary from coach to coach. There’s Art Briles and Baylor, trying to make scoreboard operators across the country file a class-action lawsuit over unsafe working conditions. There’s Mark Helfrich and Oregon, turning American football into a Marcelo Bielsa fantasy. There’s Mark Dantonio’s Michigan State and its shape-shifting defense, allowing players to make decisions on the fly. Hell, there’s even Nick Saban’s Alabama, with that inevitable death-march style its own kind of perverse art. In other words, you have all of these coaches who deeply believe that there’s a right way to play the sport. And not in the moral, honest, Ecksteinian way, but rather, “Hey, if we throw the ball 100 times a game, the scoreboard is going to explode, and we’ll all be heroes.” If the coaches in college sports are going to be the only real constants and the only ones with any true power — and as long as the NCAA exists, that’s the reality — then at least let them all be maniacs with weird ideas and ultimately tragic convictions. Yet, the ideologues seem to have left college basketball — or they’re up in Iona or hidden at Davidson, lurking at the fringes. Of course, this is a bit of a generalization and there’s some amalgam of reasons for why it seems to have happened,1 but I mean, just look at the 16 teams left: Wisconsin is extremist if you believe that “um, math” is a revolutionary approach. Bob Huggins is a king who must never be doubted. And Kentucky is a blessed beacon of how great college sports could still be if we ever decide to get honest about them. But otherwise, “defense,” “rebounding,” and “controlling the tempo” seem to be the most relevant stylistic indicators. And that’s why I love Gregg Marshall. If you’re going to function as one of these bland taskmasters who preaches hard work above all else, at least be Thomas Pynchon’s idea of the American college basketball coach. For starters, Marshall seems to have styled himself in one of two ways: “If Drew Rosenhaus had Jay Wright’s haberdasher” or “Tom Crean before he spent 70 years incubating on Dr. Mann’s planet.” With the slicked-back hair and the pinstripe suits, Marshall looks like someone whose interest in menswear begins and ends with reading the “Dress for Success” chapter in Entrepreneurship for Dummies. Carchia: Which living person do you most admire? Marshall: Charles Koch. He’s a Wichitan who owns the second-largest privately owned company, Koch Industries. He and his brother [David] are tied for the fourth-richest man in America, and he’s done it with great integrity and commitment to the community. He’s incredibly brilliant. Then, after last weekend’s win over Kansas, Marshall welcomed Kansas governor Sam Brownback into his team’s locker room. Considering that Kansas and Wichita State are in-state opponents, this is unsurprising on its face — and Brownback would’ve done the same with the Jayhawks had they won — but instead what you got was a politician who’d just cut more than $40 million in funding for public schools and higher education, celebrating with Marshall and a group of players who attend a publicly funded institution of higher education. Am I advocating for a conservative takeover of collegiate athletics? Hell no. 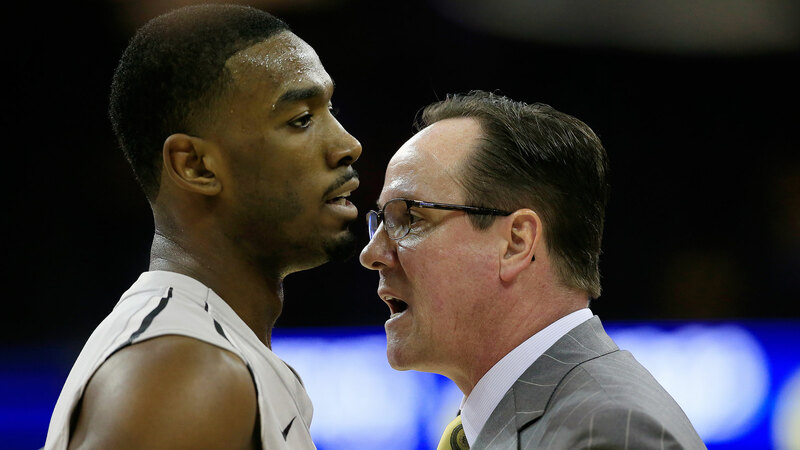 I’m advocating for more coaches to be polarizing weirdos like Gregg Marshall. There’s a basic sense of conservativism that runs through college basketball — seemingly more so than in other sports — but it feels like it’s borne out of a lack of creativity or a kind of fear of failure. At least with Marshall, there’s the suggestion of some deeper persuasion: He’s all the way out here, greasing his hair back, and letting us know that the free market is where it’s at. Plus, his team, essentially built upon acquiring undervalued assets, is really good for the fourth year in a row, with juniors Ron Baker and Fred VanVleet on the Wooderson stay-the-same-age plan. But who knows: Apparently, Alabama is willing to pay whatever it takes to bring Double-G to Tuscaloosa — GOD SAVE US IF GREGG AND SABAN END UP AT THE SAME SCHOOL — so maybe this ends up being the Shockers’ last NCAA tournament run as currently constructed. If that’s the case, the next few days are to be cherished. Gregg Marshall is still a wolf. A list: trends come in waves; professional basketball is headed toward a uniform future; one-and-dones preclude the development of any cohesive style; the shot clock is too long; the NCAA ruins everything.